This text by JENNIFER MATOTEK was published alongside LEE HENDERSONS The known Effects of Lightning on the Body exhibition. To optimally view the video of The Known Effects of Lightning on the Body, we are required to assume a humble posture. The invitation is to sit, with the option to kneel or crouch – to intimately draw near the moving image, projected close to the floor onto the surface of a 9 by 16 inch piece of copper. The video’s action is repetitive: one match lights another match, over and over again. The longer we watch the video, we begin to recognize that apart from the occasional unique response of the matchstick to the flame – it is the movement of the hand that sometimes appears to light each match that assures us each segment is unique. The Known Effects of Lightning on the Body reminds me of three previous bodies of work by Lee Henderson. The first is the book work glare, in which Henderson photographs subjects from a range of ages, lit by candlelight, with the number of candles equal to the subject’s age. The effect of photographing his subjects at the same shutter speed and aperture despite the size of the light source results in a range of effects, with the younger children captured in the darkest images, and the most elderly subjects appearing so well lit they resemble ghosts. It is a piece about photography but also mortality – it suggests that both are inextricable. In the photographic series Bowing to Every Buddha, Henderson takes self-portraits in public museums, camera behind his back, bowing before statues of the Buddha on public display. Humble posturing, self-portraiture and performativity link this series to Known Effects. But the two projects also share a solemnity, and an idea that perhaps spirituality is something that should live outside of religion, and reside potentially inside art. Staged in public galleries whose collections are typically more famous for their ownership of Western art works and artifacts, Henderson’s focus on the Buddha in these environments remind the viewer of the key gap between the West and the East, and more specifically, the religious art works of the Western world and the spiritual works of the Eastern world – quoting Coomaraswamy’s The Transformation of Nature in Art, “where European art naturally depicts an arrested action of an effect of light… (Asiatic) art represents a continuous condition…(representing things) more nearly as they are in God, or nearer to their source[i]. The third body of work that I would like to consider in my thinking around The Known Effects of Lightning on the Body, is Henderson’s recent video series, The Emptiness. The beautifully shot black and white videos reference the Western artistic tradition of the vanitas, meditating on mortality through the lens of a camera as it attempts, over and over again, to autofocus on a skull, a flower, a pepper and other items. The camera’s continual attempts to focus in on the subject enact what Henderson describes as “resolving” the image, with the camera “doubting” itself[ii]. The Known Effects of Lightning on the Body, like these previous bodies of work, refer to the difficulties in using photography to understand what a photograph is, what it is meant to be, and what it could be. Ultimately, his work is about the mortality of images. Henderson shares Bill Viola’s thought from the text Video Black, that duration is the medium that makes thought possible, therefore “duration is to consciousness as light is to the eye”[iii]. Photography has long been upheld as the most trustworthy of mediums, the most likely to show us truth, suspending life while capturing it. Manufacturing is meant to be trustworthy; ensuring that what is delivered is what we have paid for. Due to the uniform nature of the manufacturing process, when a match is lit, it should typically burn the same way as any other match. A failure to light a match using the lit head of another match is probably a defect of the manufacturing process. A failure to strike a match while pushing it across a surface, creating friction, is probably a failure of the body. The title of installation, Henderson has told me, is derived from a moment in Sarah Kember’s talk The Virtual Life of Photography. While discussing a photograph of a blurred figure struck by lightning, Sarah Kember notes, as an aside, that there are several known effects of lighting on the body. Nine times out of ten, lighting strikes do not kill-rather; lightning strikes are more transformative to personality and the body via concussion and moderate injury, than they are fatal. Kember also suggests, over the course of her talk, that photography captures life processes by suspending them – photography stills things that live. She asks the question: Is photography an agent of death or conversely, bringing death to life? Considering the installation through these pieces of information, I am reminded of how the body knows about the sensory through affect, and knows memory through the brain. Copper, the projection surface for The Known Effects of Lightning on the Body, is a conductive material, capable of transmitting electromagnetic radiation to the body upon human touch. It is also a surface which ages, and changes when subjected to the elements, like a body. Observing media, we are drawn to light sources, but also to depictions of the body, to faces, to hands, to skin. Why does Henderson seem to largely obscure his hand in The Known Effects of Lightning on the Body? It assumes that he wants us to think that the objects are more important than his flesh, that he wants the viewer to visually and aurally privilege the chemical reaction – the science (the truth?) – not the hand that makes it all possible. While we do not see the hand, we hear it off camera, lighting a match. It is interesting to consider this video as a kind of vanitas, a documentation of a performance, where nearly all of the body is taken away except for the tips of the fingers on the rarest occasion, and hearing, so quietly, on and off camera, the effects of what the body does. Perhaps we may consider the feeling that while inside the installation, we are also inside a body – the walls are painted the colour of interior flesh, of blood. Matches are a simple tool, as photography may be – not enduring unto itself, but a means to something greater, a passage to something more lasting. 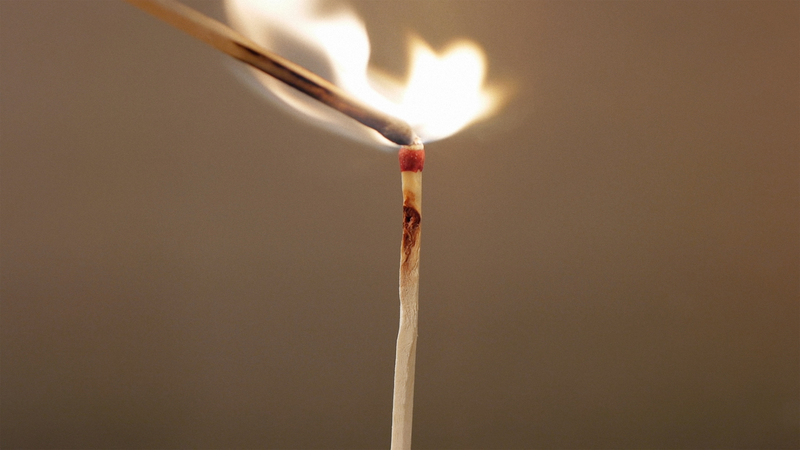 The fire from the match head will burn down the wood of a matchstick unevenly, as different parts of the flame consume oxygen at different rates. It forces the burned out matchstick to slowly and elegantly assume a humble posture, to bow before our eyes. Just as we sit humbly before them, watching their light die out before us. JENNIFER MATOTEK is the Director/Curator, Dunlop Art Gallery at Regina Public Library. She holds an MA in Art History from York University and a Diploma in Curatorial Studies. She completed an MBA from the Schulich School of Business, York University in 2011, with a specialization in Arts and Cultural Management. Matotek has held curatorial and administrative positions at the Toronto International Film Festival, The Power Plant Contemporary Art Gallery, and the Art Gallery of Hamilton. She has curated numerous exhibitions for galleries and artist-run centres across Canada and is a practicing video artist whose work has been shown internationally. Her writing has been published by Gallery 44, Vtape and Magenta magazine, among other publications. LEE HENDERSON is a media-based artist from Saskatchewan. He has studied art in Canada and Germany, with talented professionals including Maria Vedder, Brian Eno, and Ellen Bromberg. Since completing his MFA in 2005 at the University of Regina, he has been furthering his time and lens based artistic practice. Recent and upcoming exhibitions and screenings include the Zero Film Festival (Los Angeles), The Dunlop Art Gallery (Regina), The Mendel Art Gallery (Saskatoon), The Rooms (St. John’s), gallerywest (Toronto), and Kunstraum Tapir (Berlin). Henderson currently lives and works in Toronto where he teaches photography and media art at OCADU and Ryerson University. The artist gratefully acknowledges the following in the production of this show: The Canada Council for the Arts and Takt Studios and Kunstraum Tapir, Berlin.